(Orlando, Florida:) Greg Norman Jnr was just 13-years of age when I was on hand to witness him make his ‘world stage’ golfing debut teeing-up in the 1998 Junior Open Championship at the Hillside course in England. 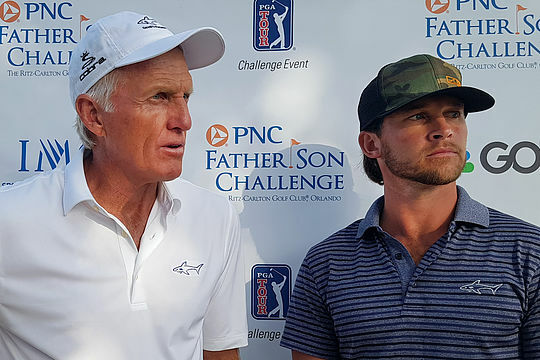 He returned nine years later as a then 22-year old to team with his father, Greg Norman, in the 2007 Father-and-Son Challenge sharing sixth place before a year later when they got back together to split the $US290,000 first prize in capturing the ADT Golf Skills Challenge. It was never Gregory Junior’s ambition to follow in his father’s 88 pro career victory footsteps but he did contest a few key amateur events including the prestigious Western Amateur while he also continued to caddy for his father in the Open Championship. But having grown-up along the Florida shoreline there was always one sport with Gregory’s name written all over it – kiteboarding. He got into kiteboarding in the early 2000s when living in Maui and hanging out with two of the legends of the sport in Lou Wainman and Shannon Best and then returning to Florida to teach friends along the windy shoreline close to his father’s Hobe Sound home. Gregory Jnr then became so proficient at kiteboarding that the University of Miami management graduate took the sport professionally including testing himself in the biggest and richest kiteboarding event there is – the Triple S Invitational – and held each year at Cape Hatteras, North Carolina. In fact, this year’s 12th staging of the event was won overall by Australia’s Ewan Jaspan. Gregory Jnr’s kiteboarding skills also led him to indulging in his other passion, waveboard riding and herein lies the next chapter in the now 32-year old’s career and that is the launch of the Shark Wake Parks. Inspired by his father to combine his personal passion and entrepreneurial drive, Gregory Jnr opened the first Shark Wake Park in June 2016 at North Myrtle Beach, South Carolina with a second location opened this year at West Palm Beach, Florida. “I was always into wakeboarding and kiteboarding in my younger days so I wanted to follow in his footsteps and take my passion for the sport and bring it to a spot where people can enjoy it like you do,” he said. And with Greg Norman senior now making more money than he could have ever imagined in golf, his son could not have a better business mentor. “He’s the best,” said Gregory Jnr smiling. However, for this weekend Gregory Jnr has swapped his waveboard for his golf clubs and with his father looking, and with the help of his son, to taste success inside the ropes for a first occasion since the 2008 ADT Skills Challenge. “Well, we’re here for a reason”, said Norman. And Gregory Jnr’s build-up to this week has led to a renewed passion for the ancient club-and-ball game. It has been great to catch-up with young Gregory having first witnessed a very diminutive-looking 13-year old walking the man-size Hillside links course to now to shake the hand of young aspiring successful businessman who clearly has inherited his father’s dashing looks and simply oozes strength and vitality.